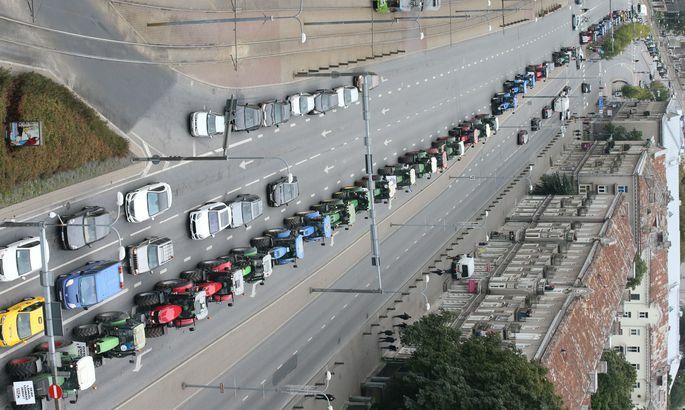 Põllumeeste traktorikolonn saabus eile Tallinnasse Toompeale Tartu maantee kaudu. 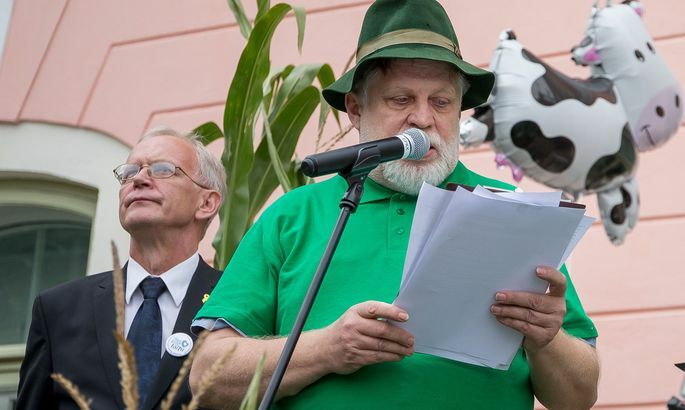 Addressing the protest rally in front of the parliament building yesterday, Tartu County farmers chief Jaan Sõrra vowed to spread dung across the castle front should governing politicians fail to deliver on EU support as promised. Tartumaa põllumeeste juht Jaan Sõrra ähvardas Toompea lossi esise sõnnikuga üle valada, kui nõudmisi ei võeta kuulda. Eesti Põllumajandus-Kaubanduskoda, Eesti Põllumeeste Keskliit ja Eestimaa Talupidajate Keskliit kutsusid kõiki põllumehi traktoritega Toompeale. Amid the many tractors on the plaza, there stood this lone horse who played its part by dropping a foretaste of the warning by Mr Sõrra unto cobblestone pavement. 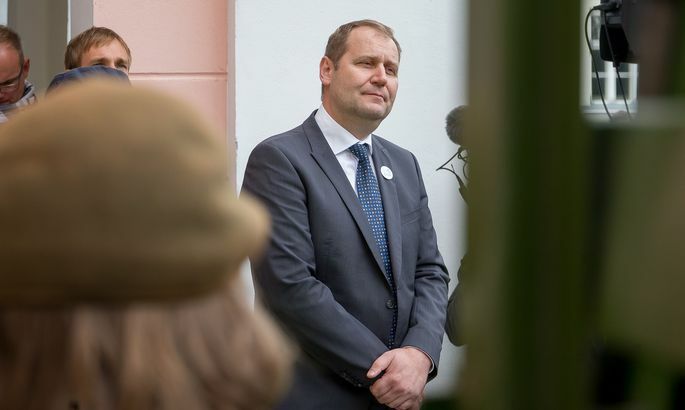 That was not the peak, however – the event culminated in a well known pig Urmas Laht coming down like thunder upon rural life minister Urmas Kruuse. While speaking, Mr Laht went as far as assume the minister’s role for a moment, proposing options altogether extreme to the crisis-plagued politician. «Would I shoot myself I do not know, but I’d surely leave the post,» shouted Mr Laht. The forceful stand triggered stormy ovations and many were the coarse calls for Mr Kruuse to go then and there. Despite the hostile air and having patiently waited for his turn, Mr Kruuse did take the floor – a lorry set up for speaking purposes. His explanations of the endeavours by the ministry to help farmers failed to make much of an impact. Nevertheless, the minister seemed to have some effect. Though silenced for a moment by a roar – as if orchestrated – from the crowd, the rage thereafter seemed to have died down. The atmosphere seemed to slip and head down the path of unseemly consent. 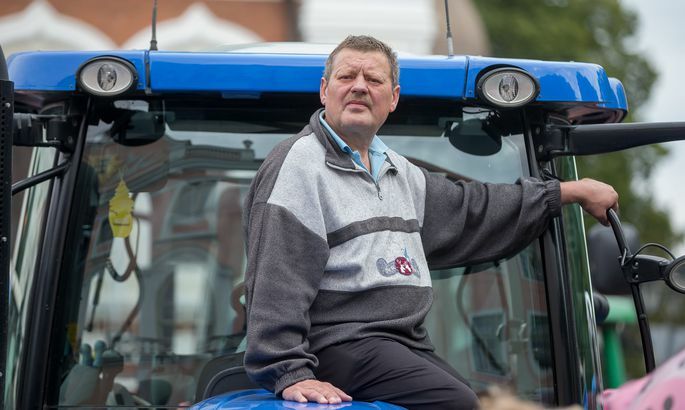 However, symbolically it seemed, it was the very person of Mr Kruuse who helped the farmers out. Namely, the minister launched into how Mr Luht, with whom they and other pig farmers had sat around a table in the ministry and benevolently sought solutions for the problems, was now avoiding his handshake at the rally. Grabbing the opportunity, Mr Laht leaped unto the podium and vigorously shook the ministerial hand. The gesture seemingly benign was followed by an angry tirade. «The no-good fellow that you are, even your taxes you’re paying for taxpayer money,» declared Mr Laht, cutting into what Mr Kruuse was saying. The mood fell back into protest lane and the shouts of «Step down!» again beat the PA system. 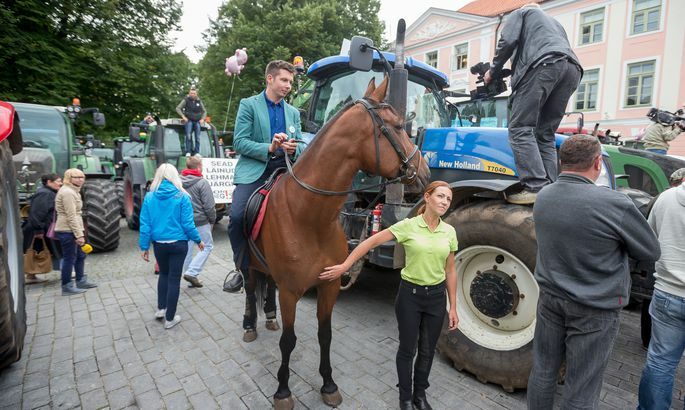 There was just one thing the protesters enjoyed more than upbraiding Mr Kruuse – doing that to Prime Minister Taavi Rõivas. «Bring us Rõivas! Bring out Rõivas! Rõivas come forth!» – this was beginning to sound like the Call of the Wild. Regrettably, Prime Minister failed to show up for the showdown. 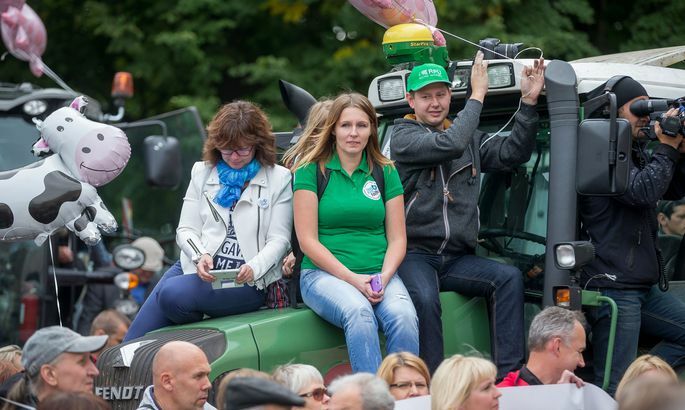 Interviewing the protesters, Postimees initially happened upon a row of cereal farmers yet to be directly touched by the problems plaguing those into dairy and swine. 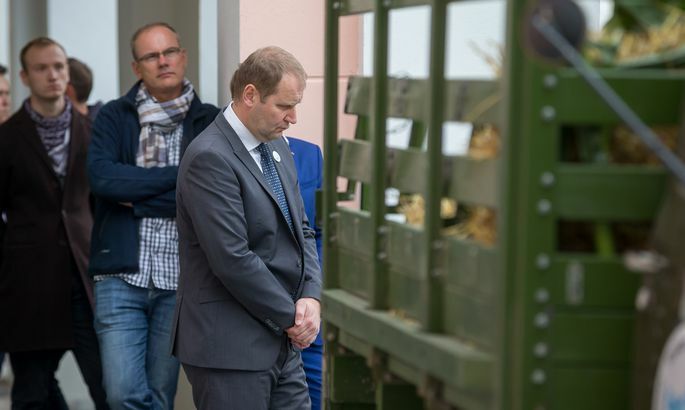 As admitted by Järva County’s OÜ Vao Põldur head Guido Kind: leaving pig and cow farmers without support, the government would surely fail them also come next year. «This year we’ll reap a good harvest and therefore the cattle farmer trouble isn’t getting to us yet. If the cattle farmers get no money next year, we’ll be bad off ourselves,» said Mr Kind. While the tractors roared in Tallinn, Estonian Farmers Federation head Kalle Hamburg was harvesting potatoes on his field. «Can’t waste the dry autumn weather,» explained Mr Hamburg. Mr Hamburg went on to say, however, that the reason farmers need state support in the budget year of 2016 having their business built on loans. Also, that would help even out playing field with neighbouring nations while Estonian government has for these two past years opted not to pay farmers support. «The state support would not even help us break even, but would provide security to the banks who lent us the money,» he explained. Any of the tractors at Toompea yesterday is worth a luxury car, and the farmers have gotten these with bank help. 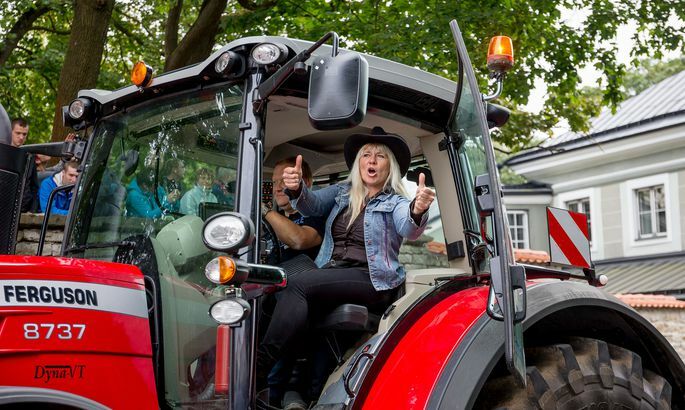 Should government reject rural life minister’s proposal to write nearly €22m of transitional support for farmers in next year budget, lots of these machines may end up back on the leasing company sales lot. «Due to the sanctions imposed by Russia, the dairy sector has in 13 months lost €50m. By swine fever, the farmers are losing two million euros more monthly,» said agriculture and commerce chamber chief Roomet Sõrmus. Talking to Postimees, Mr Kruuse admitted the rural life ministry has thus far failed to effectively stand for the interests of farmers. Having asked for €22m of support in this budget already, not a cent was granted. 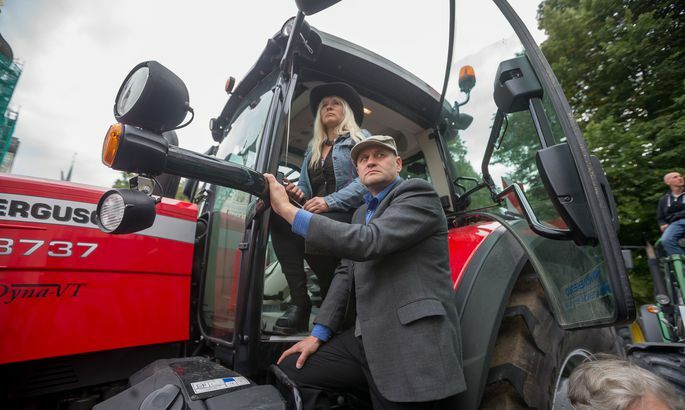 While seeking the support, however, Estonians ought to try harder to form large farming cooperatives as that would be the main lever to pull higher prices from the market-shaping retail chains, said the minister.